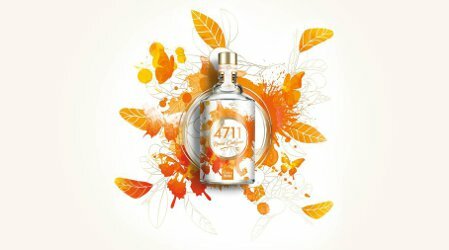 4711 has launched Remix Cologne Edition 2018, the first of a projected series of limited edition variations on 4711 (and see also: 2017's 4711 Remix Cologne). 2018 sees the launch of a new range of fragrances: Each of the seven main ingredients of 4711 Original Eau de Cologne will be "remixed" in a limited edition. The first of these is orange, which is given a modern interpretation: from sweet, fruity and tangy through to an aromatic bitterness. A fresh, brave and surprising composition redolent of sunshine, energy and pure joie de vivre. A powerful fragrance statement, which adds an exclamation mark to the summer of 2018. "The versatile orange in a juicy new remix"
Citrus notes are the most distinctive characteristic of Cologne fragrances. A good reason to begin the first creation of the Remix series with the cheerful exhilaration provided by the scent of oranges. Nicolas Beaulieu, the creative nose behind the 4711 Remix Cologne, describes the development of the fragrant Remix: “My intention was to create a complex Eau de Cologne that shows a sophisticated orientation towards the identity of the 4711 brand but with a surprising twist. The lively orange in combination with a slightly more bitter and aromatic note is seriously addictive. Its full-bodied and intense nature give the fragrance great presence and modernity." The notes include bergamot, lemon, tea tones, neroli, bitter orange, gentian, cedar, cashmere wood and musk. 4711 Remix Cologne Edition 2018 is available in 100 and 150 ml Eau de Cologne and in a 150 ml Body Spray. Thanks for the heads up, I will be on the lookout for these. They do look like fun, and nice job on the packaging. This looks like great fun,and I think the marketing is perfect! If you are hanging out with friends at the BBQ, at the park or at a music concert or festival then something fresh and happy is totally called for!